Breaks are good. Change of scenery is good. Breaking out of your routine is good. Doing something different is good. Even if it's only temporary. I can tell you, that wasn't good news. Me not running?! Dark times ahead for myself and all the people close to me. It took me two whole months until I found the time not to run. Crazy, isn't it? There was still a couple of races to get out the way before I could afford a running break for few weeks. So for how long should I not run? Two weeks he said, or three. I might feel the urge to go for a run after a week. Hold back for another week, he advised. I was dreading it. But the good news, I don't have to sit at home and do nothing. I decided to focus on strength training. As I am not big on swimming or cycling, he recommended the rowing machine in the gym in order to not lose too much cardio fitness. I have always ignored the rowing machine. It looked like like it would need a lot of upper body strength which I don't have and I struggle to get despite hard efforts in the gym. To my surprise, my efforts must have gotten me a bit further and I really do enjoy the rowing machine. It's a workout that strengthens legs and upper body at the same time plus I get some cardio in. The rowing machine has been my life saver. 10 days into my rest from running and I am not missing it at all. That means a lot. With TRX classes, some weight training and the rowing machine there is not much time to get sluggish. I never thought a break from running could be so easy and challenging at the same time. My plan was not to run for three weeks. I am half way through and I am confident I will make it and it will do me good, both physically and mentally. With all the strength training, I feel that I need to eat more these days. Regular meals don't fill me for long enough. An hour after dinner some sort of dessert has to be dished up. The Football Soccer World Cup matches with 8pm and 11pm starts here in Dubai are just another excuse to enjoy a tub of ice cream on the sofa. 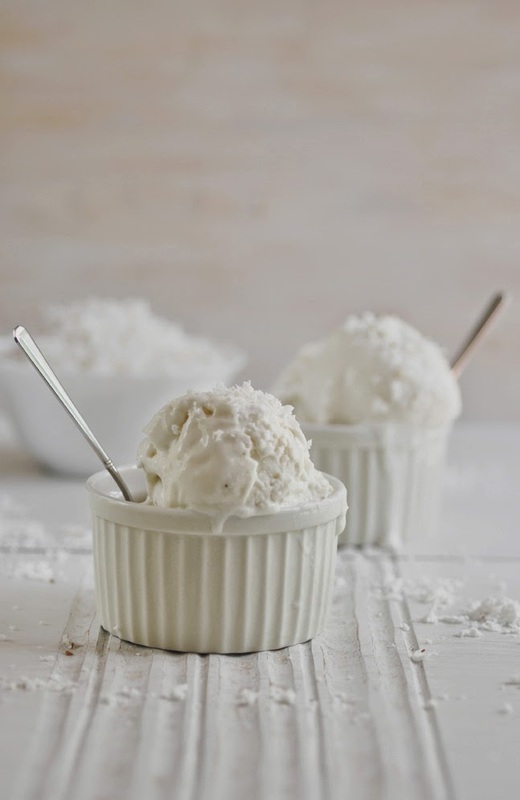 The healthy food blog world is full of coconut milk based ice creams. I have tried them and never really got to like them. I found them to thick and heavy and the coconut taste to overbearing. Something tart needed to cut through the coconut texture and flavor. So I combined it with yogurt. Now with the yogurt, it's not paleo or vegan anymore. But it is delicious. That I can assure. I hope you enjoy! If you use regular whole milk yogurt, strain 4 cups of whole milk yogurt through a cheesecloth or clean kitchen towel for at least two hours. Discard the whey. Mix the thick white parts of the refrigerated coconut milk into the strained/greek yogurt. Add vanilla extract, fresh coconut and sugar and mix until well combined. Pour the yogurt mixture into a shallow bowl or pan. Freeze until almost solid, about 1-2 hours. Take out of the freezer, and thoroughly stir it with a fork. Put back into freezer and freeze again until almost solid. Scoop out the frozen mixture and place it into a food processor. Pulse until smooth. Transfer ice cream into a container suitable for freezing. Transfer mixture to ice cream maker and follow its instructions. Transfer ice cream into a container suitable for freezing. Cover and freeze until firm, about 2 hours. If you keep it frozen until completely solid, keep at room temperature to soften a bit before serving.